Australia’s foreign minister has given what’s believed to be the first-ever political interview with emoji-only answers. The image that Julie Bishop picked to depict the Russian president was not at all ‘smiley’. The interview - an exchange of text messages, with Bishop required to stick to images instead of verbal answers - was done by the online news resource, Buzzfeed. The minister was apparently approached with an offer to try the unconventional type of interview as she is herself an avid user of emoticons on her Twitter account. Sometimes, as in her Christmas message, she uses them and nothing else. “The foreign minister accepted the challenge [of an emoji interview] in the spirit in which it was offered to her," her spokeswoman said, according to AFP. Foreign policy questions can be answered pictorially, the interview shows. 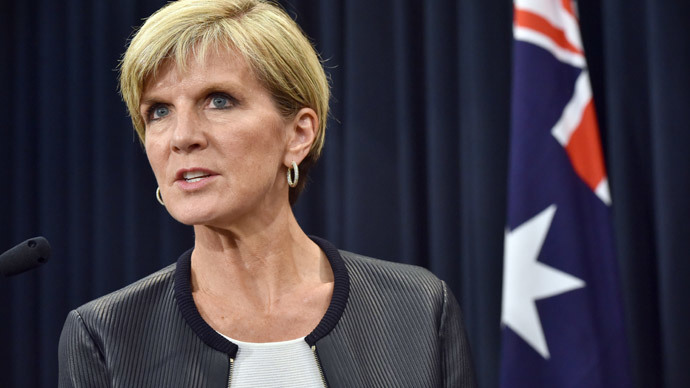 Relations with the US and China were described by Julie Bishop with happy smileys and thumbs up. Australia’s top diplomat was however hardly diplomatic when asked to describe President Vladimir Putin with one emoji. The reply was a red angry face. Bishop was kinder to her prime minister, Tony Abbott, portraying him as a running man, referencing his addiction to fitness. Communications Minister Malcolm Turnbull, according to Bishop, could best be illustrated with a picture of a mobile phone. An expressionless smiley with a straight line for a mouth was the minister’s answer to the question of whether she wanted the post of prime minister. She was also asked some non-political questions, which revealed her guilty pleasures are high-heeled shoes and donuts, she keeps herself fit by running and her favorite emoji is a winking smiling one blowing a kiss.